Heading out for a beautiful day. UMass working on the world's longest sushi roll. Some new graffiti to start the year at UMass. They are still at it. This mural's got a secret. This is a bathroom at UMass. Chalk art on the sidewalks of Northampton, Massachusetts. A pretty busy last few days, unfortunately, can mean less cool photos. Sean's chicken tempura, aka, fried fan. My friend Katy's mom frying some leeks. Look hard, there are baby blue eggs in there. There's nothing like starting the morning with a kitten who thinks she's a princess. Since I keep my eyes open for the hard-to-see. Check out this graffiti, which can be seen in Amherst and Northampton (if it hasn’t been removed). I first saw this tag at UMass Amherst in the spring. This is what the tagged area looks like as of this week. The tag “MGK,” the phrase “Kilroy was here,” and the image of Kilroy Was Here appear to be connected. I Googled MGK. Those letters could stand for anything, or nothing at all. I’ll list a few: insecticide products, Machinegunkeyboard.com, Machine Gun Kelly, Mightygodking.com, the McLaughlin Gormley King Company, MGKrecords.net, or a Mega Growing Kit, . The meaning behind Kilroy is an interesting read, however. 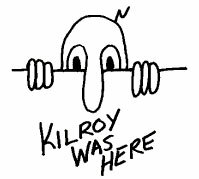 According to the editor of Kilroywashere.org, Kilroy started as a graffiti-like doodle. Most of the information on Kilroy War Here, or, perhaps James J. Kilroy, a WWII shipyear inspector, is considered legend, according to Kilroywashere.org. I haven’t discovered who is making the Kilroy references, and I don’t know who MGK is. Matt Pilon of The daily Hampshire Gazette wrote this article on two males who were arrested for graffiti vadalism, or were going to be committing the act. Kilroy appears “everywhere” today. Even gracing the title of a Styx album. So, keep your eyes peeled.